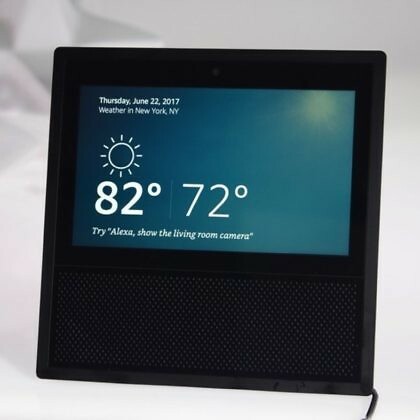 The Amazon Echo Show, a digital smartspeaker that includes a touchscreen, has received a new feature to make it easier for people that have a speech or hearing impairment to interact with the device. The feature called ‘Tap To Alexa’ allows the user to tap the screen to interact with the Alexa digital assistant instead of using verbal commands. Once the feature is enabled, users can tap on the information they want instead of providing the equivalent verbal command. The feature includes shortcuts to common Alexa items like weather, timers, news and traffic, and users can also type out Alexa commands. Additionally, while Amazon launched its Alexa captioning feature in the US a few months ago, it’s now releasing that feature to users in the UK, Germany, Japan, India, France, Canada, Australia and New Zealand. The following YouTube video also provides a bit more detail on how the new feature works. The primary difference between the entry-level Amazon Echo smart speakers and the Show is the addition of a touchscreen which provides visual information in addition to audio-based feedback. As such, this makes the device much easier for people who are Deaf or hearing impaired to use as they can visually see the information. The addition of caption support also helps in mirroring the verbal interactions with text on the screen. To enable the Tap To Alexa feature, users will need to navigate to the Settings section followed by Accessibility, then touch on the ‘Tap To Alexa’ option. Additional information about the Echo Show can be found on the Amazon website.